As a Flight Attendant, by the time my out-dated netbook powers up and gets online, it’s time for “another city!” As someone who sees many users of netbooks, tablets and full sized laptops…the Intel-powered Ultrabook is the future. Quick, powerful and efficient, what’s NOT to like?! Although my laptop is portable, it is not convenient. Teachers expect me to carry all my text books and my old, outdated, heavy laptop. Something sleek and light would be so much nicer. To Spoil My Future Niece/Nephew!!! I JUST found out that I’m going to be an Aunt for the first time!!!! 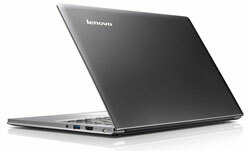 I need the Lenovo Ultrabook for online shopping so that I can spoil my future niece/nephew rotten! Because my brother is in the Army and always on the go, it will also allow me to Skype with them so I can see the little peanut more often!!! I have a boat anchor and need something lighter and smaller for a vacation trip! Who wouldn't want a Lenovo Ultrabook??? What a great giveaway! Thanks, Techlicious, for sponsoring this. I, like so many others, have an old machine that needs to be replaced. Please consider me! I hardly ever win anything but winning this would be great!! There are four of us in the family and only one computer. It would be wonderful to have a second one and a laptop would be perfect!! Our straight A, Honor Roll student could put it to good use!!! I work from home and I’m tethered to the wall with a laptop that needs to be plugged in after about an hour of “unplugged time”. Imagine the places I could go with this Ultrabook! I NEEEED a new Lenovo because my desktop computer is 8-years old and my “laptop” is an underpowered 1st-Gen Samsung Q-1 that can barely weaze its way through the simplest webpages. Electronic devices, cell phones, and computers will seem to have a life of their own today. They may do a lot of things, behave strangely, or break down unexpectedly. You may need to spend some money to bring your technology up to date. I work with students in postsecondary education who have disabilities. At our university, I am the person students meet with to discuss their technology needs, wishes, and wants. Thus, I do lots of demonstrations related to hardware and software. I’ve been using a Lenovo laptop for a number of years in this capacity. But it’s running ‘behind the times’ at it would be nice to upgrade to a newer model! Perfect way to relieve my back problems! I have a back problem which could lead to a herniated disk and was told by my doctor not to carry heavy things. So this would be perfect for my daily use at the university where I go up and down the stairs. Also, it would be excellent for the month I travel to Portland with exchange students as I would have access to trip planning and activities in the computer for 8 hours without having to worry about the battery. I need a new computer…and a thin one would be super! If you look at my URL, you will see why I need this laptop.It is the main reason I am able to win my fantasy football league.Keeping up on the go is a must.And setting your lineup or picking up players cannot be done on a phone! (as I found out when Victor Cruz was available and I was too late getting to a comp. )SECONDS MATTER in this thing!!! This is my third Championship in 6 years.DON’T LET THE DYNASTY die! !If I win the Lenovo Ultrabook from INTEL, I will rename my team…..“TECHLICIOUS”.So come on, help me RULE THE FANTASY FOOTBALL WORLD!! I am a Great GramMa….GramMa…Aunt…Great Aunt…and now a Great Great Aunt….Keeping up with this growing family is not an easy thing! I would love the opportunity to win this Ultrabook to have a bit more speed and flexability with the chore. Would love to win a Lenovo U300s Ultrabook since I currently am using a very old desktop which is very very slow. It is hindering me from getting a job because it takes for ever to submit an application etc. Would love to upgrade to a Lenovo Ultrabook and the flexibilty that comes with it. A new laptop would be an awesome gift for my husband, who gives so much to all! my lenovo is so old its an IBM and I cant access web wirelessly and cant find a battery for it. This would be awesome, my laptop is so huge and heavy. Perfect portability with everything at my fingertips! 8 hours battery life would totally rock my boat! The Lenovo Ultrabook would be the perfect travel companion for my husband and myself while we’re doing one of our favorite things, road trips! Lightweight, thin, and an 8-hour battery would make it so perfect for our travels, and we wouldn’t be sacrificing power or functionality! It would be fantastic to win this notebook because I’ve never had one and I’ve never won anything either!! There are so many people out there that no doubt need one more than me and if I don’t win, I hope one of those people does. Thanks for the opportunity to try for it!!!!! I saw your write up about it at the electronics show and would love to upgrade to it. I travel a lot and it would make life so much easier! I would love to win this wonderful laptop! I have an old desktop ( that needs to be replaced) at home that I use for my business and it would be great to have a laptop for my kids to use for their homework, etc. Thanks so much for the chance to win! I’ve never owned a laptop, or even a smartphone, only my big desktop, so a laptop would be an excellent upgrade! I work in online events… and also manage remote folks. The lightweight, yet powerful processor and the ability to “wake instantly”... can I say finally! Would love this laptop! I do the genealogy for my family and am planning a trip to collect data and photos. I do not have a means to instantly record the data, etc., as I search for clues. This would be the perfect solution! I need a new Intel-powered Ultrabook because finally I found a successor for my Desktop PC that worth the change. Our family laptop is outdated, so we could sure use a new one. Love the long battery life too. You are right we would definitely take on our family road trips. My current computer is literally a turn of the century computer. It was manufactured in 1999. A replacement is sorely needed. I’m working with a local VA hospital to help returning veterans with resumes, interviewing skills, and tutoring. My current computer at home is out of date and shared with my husband. It would be great to have an up to date computer to devote to this work. This would be perfect for when I start my new job which will cause me to spend a few nights away from home every month. With this I could keep in touch with home, keep up with e-mails and of course techlicious. I could also use it to look up routes and destinations I may be unfamiliar with while on the job. After 2 1/2+ years out of work, I’m looking forward to a great start in this new year. We’re taking a trip this summer, and I need a new laptop so that I can monitor my husband’s small business. I’m getting old, and need a lightweight laptop. I need a new Intel-powered Ultrabook because my old Lenovo laptop is making funny noises, crawls at a snails pace, and I can’t afford to replace it right now! I need to replace my old Lenovo Ideapad (which I really love) with a a newer, more sophisticated Lenovo laptop. I am disabled due to 3 health problems.I only leave the house for DR. appts.My only source of entertainment is my computer on which I play games. My desk top is very old and I can not sit in a chair very long. A laptop would allow me to use it in bed or on the couch. My old laptop is starting to overheat, and this new ultrabook sounds like just the ticket! Cool and light, and more powerful than my old one. Thanks for offering this great prize. It is so time to stop sharing a laptop with four other people. It would be nice to be able to work on a computer without having a time limit. My desktop is 7 years old and I use it for business. I do have a small laptop for backup email and browsing, but it does not have the documents, etc on it and I need to replace the desktop with all info intact for regular use. my current laptop is falling apart! the keys get stuck, and there are lines going down the screen. I am in serious need of a portable computer to use for my online business. Something that can handle all the things I need to do myself like the graphic design programs, video editing, and memory for all my files. Lenovo has been on my list for years and during this time of extreme poverty in my life its now just a dream to own such a great piece of electronics. I could really use a portable computer to work with photos on so I’d be able to do some editing while away. My laptop is so old that it actually is missing letters as they’ve popped off and can’t be replaced. Help out this disabled Senior, please! We lost our satellite (HughesNet) and computer during the 4-27-11 tornado. My daughter, 18, just started Shelton State and could really use a computer for school. Some of her books costs $200 each, and it would be so much easier and so much more economical if she could download her text books on a computer. I am a freshman in college. Being an electrical/mechanical engineering student I’m required to use computer resource intensive programs such as Auto CAD and Auto CAD Inventor. The Lenovo Ultrabook has the resources to support such programs. Being a college student I try to be very frugal with my money and spend it wisely. I make due with what I’m given. I would appreciate the Lenovo Ultrabook not only because of its ability to do resource intensive task, but also because I can’t spend the money required for it because of the high priority tasks and commitments that come with being a college student. I want to get my husband into the 20th century (at least). A new laptop that’s not a “luggable” will help to get him there and this would nake a great birthday gift! I love Lenovo—had a T40 in my days in field sales and it was bulletproof! Miss that reliability. I’m starting an internet retail business with a friend of mine and will need to keep tabs on our business and marketing. I could only dream of using an Ultrabook to do this! Thanks for the opportunity Lenovo & Techlicious! I owne an Acer Laptop, and it is only 3 years old. The Acer Laptop has been sent back the the Acer repair Center 3 times already, I have had constant promblems with this Acer Laptop. I am in need of a Lenovo Ultrabook!